This page will be an ongoing project, the size depending on how many different postcards I can obtain that it is still possible to take a current photo from the same spot. 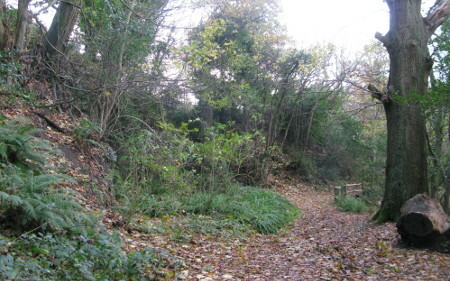 The most numerous postcards from the Country Park are of course of Lovers’ Seat of which nothing remains, the site of which can be seen on the 1909 footpath map on the Historical Maps page. There is another page showing the changes to Lovers’ Seat through photographic postcards. 1. 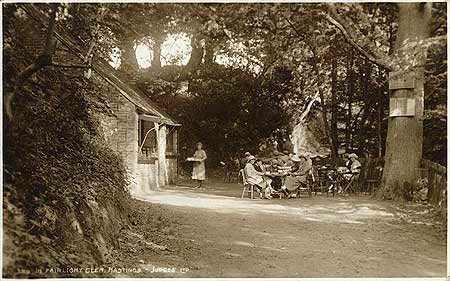 This tea garden with it’s brick built hut features on many postcards with views from both sides. This one from the Judges serial number was published between 1903 & 1909. It seems to have produced for a long time as I have seen one with a 1945 postmark. 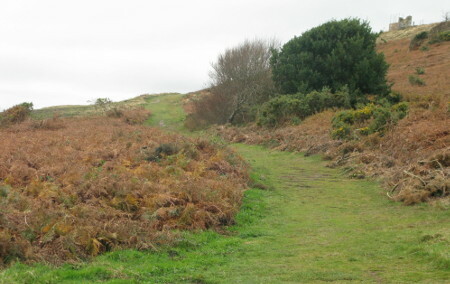 The building does not show on the Ordnance Survey 25 in:mile map published in 1899 but does on the one published in 1909, surveyed in 1907, so must have been built 1903-7. 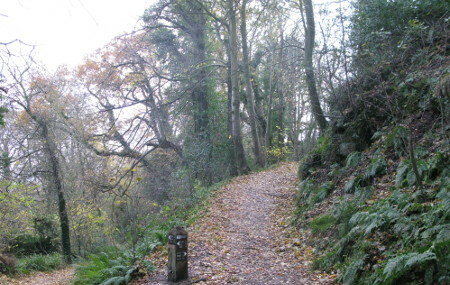 The sender could not have visited the glen then as it was still fenced off from the public by the War Department. 2. 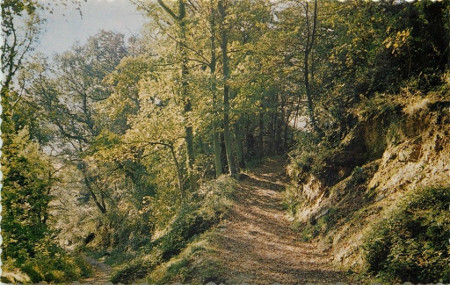 This postcard shows the footpath (on the right) coming down into the glen from Barley Lane which was constructed by the Parks Department right up to Fairlight Road 1951/2 as a requirement of the conveyance of Ecclesbourne, Fairlight and part of Warren Glens to Hastings Corporation from Major Sayer. 3. 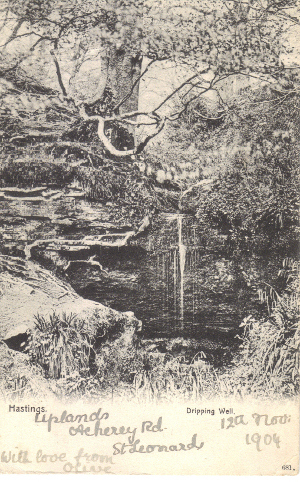 This postcard of the Dripping Well is dated 1904 and the vegetation in this and the now photo prevent us from seeing much of the actual landscape. 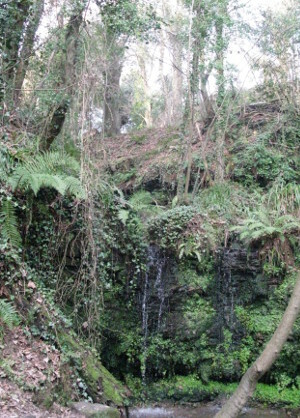 The main difference is that now there are two distinct waterfalls, being fed from two separate culverts. OS mapping surveyed in 1872 also shows water flowing from two points, making it difficult to draw any conclusion but probably just means that two separate paths have been established. 1. 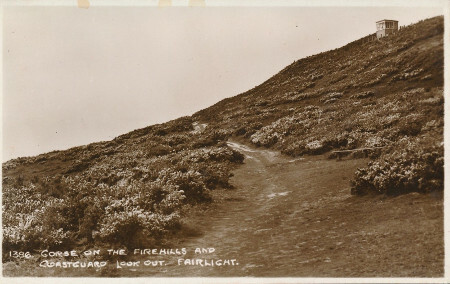 This postcard photographed from almost the south easterly corner of the Country Park shows the Coastguard lookout that was finished in December 1927. It has no postmark but I think we can assume that this was produced around that time.